When the east wind blows chilly and Starbucks starts putting pumpkin in EVERYTHING, you know Halloween is just around the corner! Parents usually have a little extra fun when Halloween rolls around, especially parents of littles. Not only do you get to raid your kid’s candy stash, but you get to be the final say in the costume department. Part of the perks of being a parent is dressing up your kid to go with your own awesome costume. These hilarious photos show grinning parents proudly displaying their favorite nerdoms on their progeny. It’s parenting done right! Read through to get some ideas for your next costume, since kids make the best accessories. It’s twice the cute with half the effort! This kid is a slice off the old block. 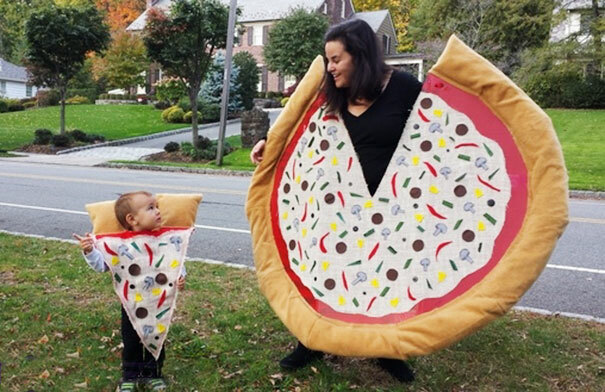 He doesn’t even look like he’s old enough to eat pizza yet, let alone dress up like a delicious slice! His mom gets points for originality though, as I would have never thought of this. But let’s ask the burning question here: is this deep dish Chicago style pizza or New York Style pizza? We have a feeling that some parents will love this costume if it’s Chicago based and some will hate it for the very same reason. Come to think of it, this really is a polarizing Halloween costume.